Multi-platform : Android smartphone / tablet / smart TV / TV box / Windows XP/7/8/10 / Sony PlayStation 3 / Samsung Gear VR / SteamOS. With dual vibration motors, realistic vibration feedback can be easily and fully experienced in racing games, sports, shooting and other types of games. The trigger buttons have been toned up to the next level of precise controlling. 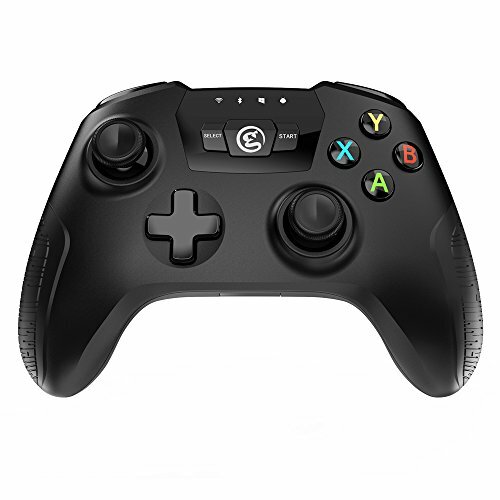 The analog sticks have 360 accurate positioning to ensure every movement you desired comes reality! GameSir has strict quality control system both on material application and technology processing, A/B/X/Y, D-PAD, L1/R1/L2/R2 silicone pads are made of anti-strike, highly sensitive and conductive silicone material, all pads have been pre-tested by strict pressing of one million times. When the battery is low in wireless mode, the XINPUT and OUTPUT LED will start flashing. Multi-Connection Types：Wireless, 2.4Ghz USB dongle, Wired USB cable.